Here are some interesting facts concerning the premise and main themes of The Westhampton Leisure Hour and Supper Club. Do they inform or enhance your reading of the novel in any way? The Westhampton Leisure Hour and Supper Club and Serena Lyons’ estate, La Doucette, was inspired by the Captain Rogers’ House on South Country Road in Remsenburg, NY, which is a hamlet of the greater Westhampton area. Built in the 1830s, one Mrs. Edward Lyon used to a host a club called The Leisure Hour and Supper Club in the house on Friday evenings during the 1930s. The Great Hurricane of 1938, also known as The Long Island Express and Great New England Hurricane, remains the most powerful and devastating hurricane on record in the Northeast of America. A category 5 hurricane, it caused $39.2 billion worth of damage (by today’s standards), claimed nearly 700 lives, destroyed over 57,000 homes, including cherished landmarks, and felled 2 billion trees. Tragically, nobody in the Northeast was made aware that the hurricane was approaching. Charlie Reid, who worked in the Weather Bureau in Washington, D.C., correctly mapped the path of the storm and its severity on the morning of September 21st, 1938, but he was dismissed by his superiors, one of whom, the Director, was in a hurry to leave early for his daughter’s birthday party. Had the alert been sounded, hundreds of lives may have been saved. Westhampton was the worst hit of the Long Island communities. Lilacs are a prevailing symbol in the novel. In many cultures a symbol of love, they are also thought to be terribly unlucky. The myth says that Death arrives, if they are shorn from their branches and displayed inside houses. The character of Annabelle Adams was christened in honor of the Annabelle hydrangea flower, which blooms throughout The Hamptons during the summer months. One of the most charming sights of the season, they own a haunting perfume, offset by the beauty of their delicate white petals. The character of The Emperor was inspired by The Emperor of Exmoor, England, a nine-foot-tall, three hundred pound red stag, who was reportedly killed by a licensed hunter during the rutting season in 2010. His death, however, remains unverified as local observers seemingly sighted him days after his body was allegedly found. Although deer stalking is legal in England, the possible death of The Emperor of Exmoor prompted several MPs to sign a motion with the intent to ban the hunting of wild animals in Britain. In December 2011, a head said to resemble The Emperor’s was hung in the Hartnoll Hotel in Bolham, Devon. It was subsequently removed after the hotel was the recipient of threats. The character of Captain Lyons and the ledgers in which he commemorates the five best moments of his sailors’ lives – the ‘Five Things’ – was inspired by my family’s naval history. My Great-Grandfather and two Great-Uncles were all merchant seamen in the British Merchant Navy. My Great-Uncle Robert died at sea on his first voyage out at the age of fifteen and my Great-Grandfather spent the rest of his life trying to find his grave. My Great-Uncle Arthur’s boat was torpedoed at the onset of World War II, whereupon he was rescued and taken as a POW by a German ship, which was also subsequently torpedoed. He was declared Missing in Action, although my Great-Aunt Alice never failed to believe that he would return to her. The idea for Captain Lyons’ ledgers derived from my Great-Grandfather’s naval logs, which my mother inherited, as well as the letter my Great-Grandmother received from the nurse in Nova Scotia where my Great-Uncle Robert died, into which the nurse had pressed a sprig of lilac. Much of the gossip featured in the party scenes derives from fact. In particular, the story about heiress Jesse Woolworth Donahue and the rumors surrounding the redbrick wall on Gin Lane, which still stands. The admittedly uncorroborated story was that she built the wall at the foot of her property—the opulent Tudor mansion, Wooldon Manor, now sadly torn down—to obstruct the view of The Southampton Bathing Corporation, which had refused her membership to the club. Apparently she built her own swimming pool, which was unheard of, and the wall to spite them, possibly providing the inspiration for her cousin Barbara Hutton’s later infamous contention that “living well is the best revenge”! 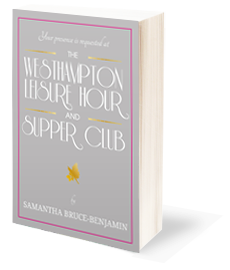 These questions are intended to enhance your book group discussion of The Westhampton Leisure Hour and Supper Club by Samantha Bruce-Benjamin. *Please note that some of these questions reveal certain plot points that you may not wish to know before you have finished reading the novel. Invite Samantha to join your book club. Email her at samantha@samanthabrucebenjamin.com to set up a virtual author visit. The cover of the The Westhampton Leisure Hour and Supper Club invites you, the reader, into the party as one of Serena Lyons’ treasured guests. With which one of the guests would you choose to spend the evening, and why? Throughout the novel, we learn about the five best moments in the life of Serena and her guests, with the exception of The Host. Discuss your favorite moments in the context of each character’s life and the light each sheds on their character. Did any of them surprise you? What do you think the five best moments in the life of The Host might be? There are many different characters in The Westhampton Leisure Hour and Supper Club, from The Host to Helen Fitzgerald, to May Cook, all of whom contribute to our understanding of Serena. With which character do you most identify? Why? Are any of the decisions they make on Serena’s behalf – in terms of not revealing what they know about Kit or Serena’s history – justified? Or do you feel that Serena plays an equal role in determining her own destiny through the choices she makes? The Host’s character is shrouded in ambiguity. Do you sympathize with the dilemmas he faces throughout the novel? Do you consider him to be a hero or a villain? There are many recurring symbols in the novel: the lilacs, the stars, the Five Things, The Emperor, the party itself. Discuss how the symbolism enhanced your reading of The Westhampton Leisure Hour and Supper Club and which symbol proved most meaningful to you. Do you think Serena Lyons’ life wasted in terms of the vigil she maintains? Do you empathize with her plight or are you frustrated by her passivity? Is she a victim of circumstance, the choices she makes, the era within which she lives, or is she heroic in the face of unimaginable loss? Of the five minutes that elapse, which one is your favorite? Discuss why. Discuss The Hamptons of the 1930s. Is it an era within which you would like to have lived? If so, what appeals to you most about living during that time, as opposed to modern-day society? When the last and uninvited guest – The Great Hurricane of 1938 – arrives at the party, the respective fate of each character is sealed. Would you have preferred a different outcome or partner for any of the guests? If so, why? The conclusion of the novel challenges nearly everything the reader has been led to believe throughout the book. Were you surprised by what was revealed? In re-reading earlier passages, do you see any foreshadowing of what ultimately transpires?